This is a list of Michael's past Chernobyl photography events. Dec. 2-13, 2009: ХОТИМ, ЧТОБЫ ПОМНИЛИ (Wanting Remembrance), Gallery Creativity, Moscow. See details. Sept 3-Oct 30, 2009: After Chernobyl exhibit, Madison Municipal Bldg. Artspace, Madison, WI. See details. June 5-July 3, 2009: Inside Chernobyl exhibit, Slavutych Museum, Ukraine. 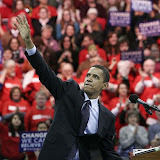 June 5, 2009 at 7 p.m. Inside Chernobyl exhibit opening. April 24-May 8, 2009: Inside Chernobyl exhibit, Shevchenko Park, Kyiv, Ukraine. April 24, 2009 at 3 p.m. Inside Chernobyl exhibit opening. Dec. 21, 2008. 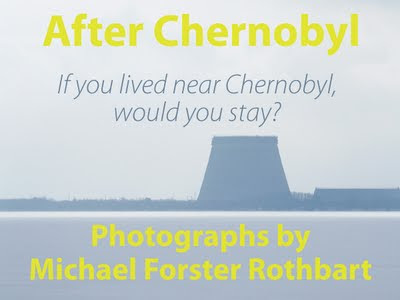 Chernobyl Today: talk and slideshow, 1420 Hill St., Ann Arbor, MI. Dec. 11, 2008. Chernobyl Liquidators: slideshow, Centre Dovira, Ivankiv, Ukraine. October 30, 2008. Benefit event. Oakwood West, Madison, WI. See details. July-August, 2008. After Chernobyl exhibit. UW Health Sciences Learning Center, Madison, WI. See details. June-July, 2008. After Chernobyl exhibit. Bethel Fireside Gallery, Madison, WI. Reception June 22. See details. June 27, 2008. Chernobyl Town Meeting. See details. A prostitute in the red light district of Amsterdam negotiates with a group of three young men over the price of her services. Amsterdam is a bizarre place. I was flying from Kiev to Detroit when they shut down the airport because of fog. I was stuck in the Netherlands overnight. So I took my camera and wandered around the red light district most of the night. I especially liked the glow-in-the-dark underwear. But is very odd the way "normal" stores, (a bar, a shwarma stand, a tourist souvenir shop) stand cheek-to-bowel with the women of the night behind their big windows. Got yelled at by a drug dealer for taking photos of him, and challenged by a pimp for taking photos of his girls. After that, I put my camera inside my coat, lens barely sticking out between two buttons, and shot this way. 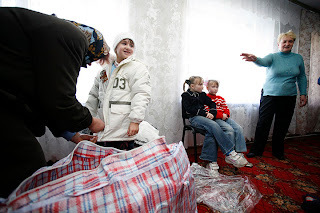 Nina Rudenko, director of the orphanage in Vovchkiv village, near Chernobyl, oversees the distribution of clothes from a Spanish charity. Students at the Perspective English school in Slavutich gossip while they look up words in a dictionary. Today I like this picture but yesterday I hated it. An elderly woman prays during a service at the small Ukrainian church in Novo Ladizhichi village. "New Ladizhichi" was built in 1987 to house evacuees from the original village of Ladizhichi following the 1986 Chernobyl accident. The church has been under construction for a full decade, as villagers have had trouble raising enough money to continue building. Because the church is unfinished, it is decorated with temporary posters rather than paintings. Sometimes the best photos are hiding in the corners. 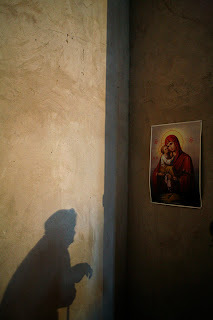 I was photographing this service when I got intrigued by the shadows. I have started a series of Chernobyl photos in which people appear only indirectly. This fits. man, those girls could dance! Teenage girls from villages near Chernobyl come to the community center in Borodyanka for dance lessons. I've been too busy shooting and too far from the internet to post much lately, but in the coming weeks I'll start sharing some recent work from my months living in Sukachi village, near Chernobyl. Full caption: Dance and music teacher Lesya Kostenko (left) leads a dance rehearsal at the Chernobyl Community Center in Borodyanka, Ukraine. Her students, including Ira Dovstenka (in white), and Olya Shvitka (in black) are all 14-year-old girls from the village Nove Zalissya, 7 kilometers away. Borodyanka is a small town (population 16,000) where many Chernobyl evacuees were resettled in 1986, 30 miles west of Kyiv and 30 miles south of the Chernobyl Exclusion Zone.